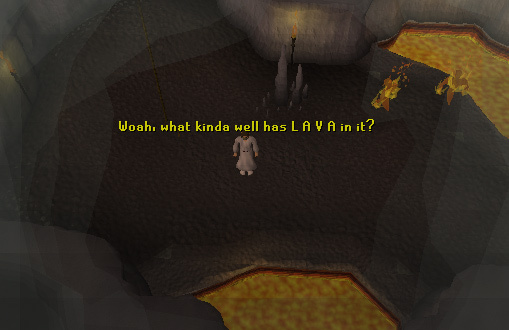 The Smoke Dungeon is accessible through the Smokey Well, and it is a top choice for higher levelled players looking for Dust Devils to slay if their Slayer level is at least 65. It's also home to Fareed, who you fight in Desert Treasure. The Smokey Well is south of Shantay Pass, and west of Pollnivneach. 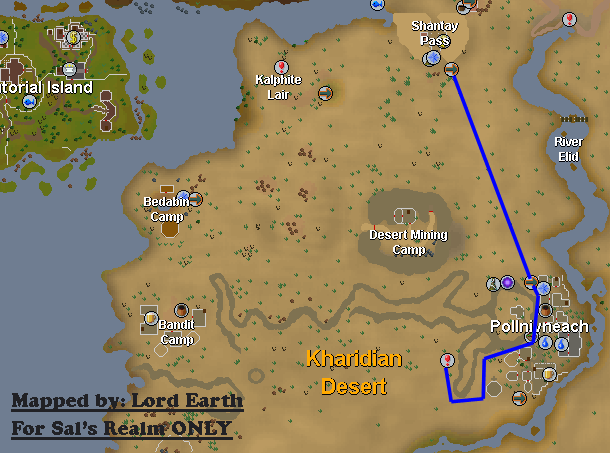 It is suggested that you take the Magic Carpet for 200 GP to get there fast. Once you get dropped off, head south until you see the cliff at the western side of town, which you follow until you see the Dungeon ( ) icon, which is the Smokey Dungeon. 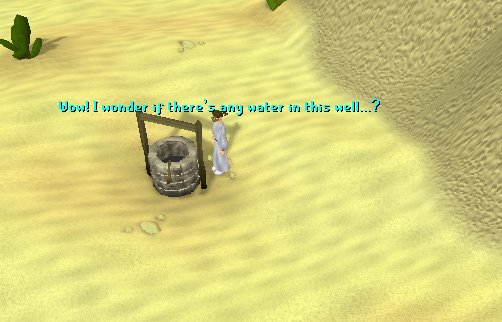 The first thing you should realize about this well is that it lives up to it's name in being smokey, which is why the screen warps around you, and that there's not any sign of water, but lava instead. 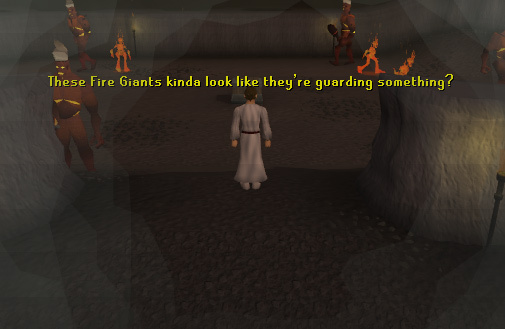 Also, you'll probably notice the two Fire Elementals waiting for you in the entrance. If you head east of the entrance, you'll right away notice the Dust Devil, which once again requires a Slayer of 65 to fight. 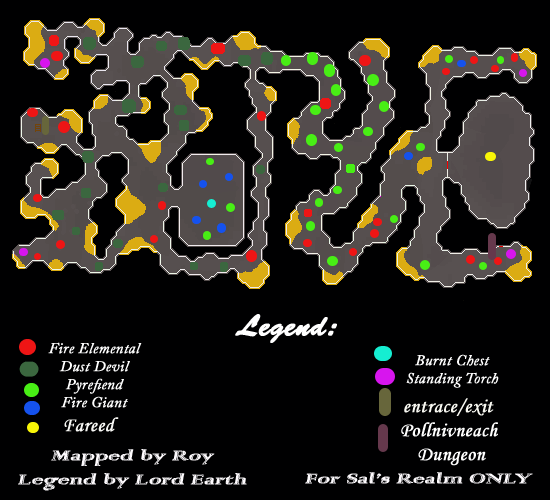 If you study the map above, or just explore the dungeon enough, you'll notice the Dust Devils are only on the west side of the dungeon, so if you plan on Slaying them don't bother traveling to the eastern side of the dungeon. 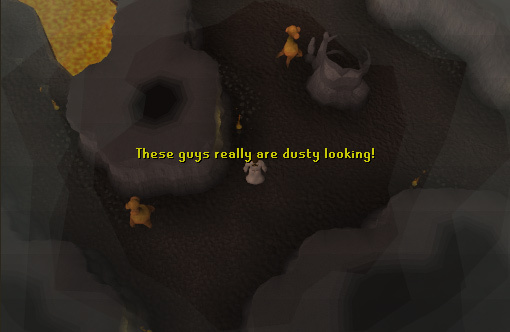 Dust Devils are also known for there very rare chance(about one in 10,000 chance) at dropping a Dragon Chainmail. You should eventually notice the large rectangular room south east of the entrance eventually, this room contains the most amount of Fire Giants in the dungeon here. These monsters are excellent for training on and are often killed for their multiple rune drops, including: Rune Scimitars, Rune Two Handers, Rune Kite Shields, and Rune Platelegs. They surprisingly drop rune items quite frequently. Also in that same rectangular room, you'll most likely notice the "Burnt Chest" in the middle of the room. 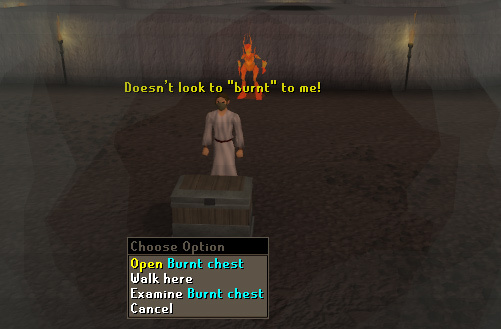 This chest is used in the Desert Treasure quest and is accessed when you light all four torches and reach the chest before any of the other torches go out. The chest holds the key in order to give you access to the place you fight Fareed. 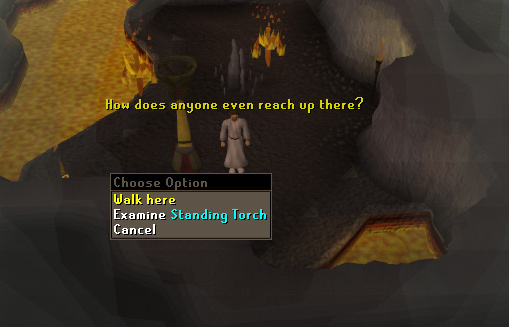 You also need a Tinderbox to light the torches which are located in the four corners of the dungeon.